Ellison grew up in Whiteface, Texas and played college football at McMurry University. There he began his coaching career in 2002 as a student assistant for the War Hawks. Ellison then spent time at Lubbock Estacado, Breckenridge, and Pilot Point. He also served as offensive line coach at state-recognized powerhouse Galena Park North Shore for seven years. 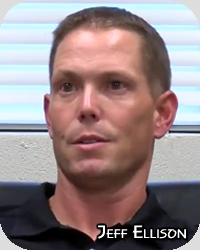 Ellison became part of the Mojo football coaching staff in 2013. During his stay at Permian, the Panthers have recorded a 38-18 record with a district co-championship and three playoff appearances. More than likely, the remaining coaching staff will stay intact for the 2018 season. The ECISD athletic office will perform the usual job opening search for the contracted full time head coaching position after this upcoming season is over.